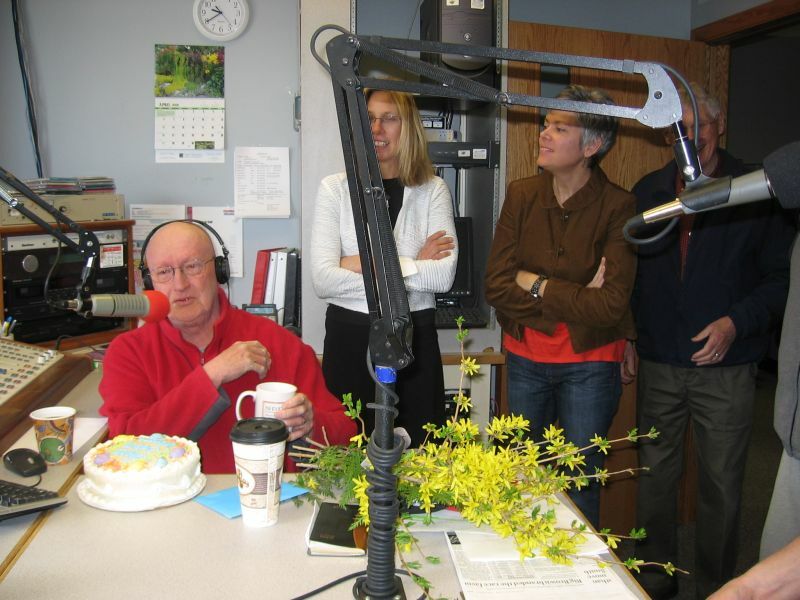 Members of the NDDC stopped in the studios of KYMN Radio this morning, in Downtown Northfield, to celebrate Wayne Eddy and his many contributions to the community. The occasion was Wayne’s 500th radio show, The Wayne Eddy Affair, since his return to the airwaves of KYMN two years ago. NDDC President Mary Rossing brought flowers, Jim and Joan Spaulding, from The Hideaway, brought a cake and coffee, NDDC Secretary Keith Covey brought an NDDC coffee cup, and the rest of us brought high spirits and deep appreciation. It’s people like Wayne that help make Northfield a great town and businesses like KYMN that make Downtown a great place.